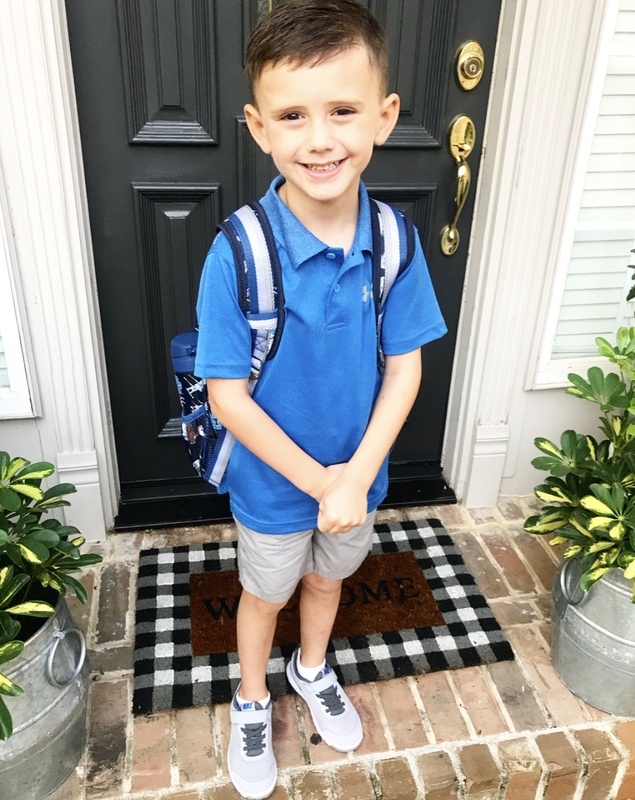 Yesterday the sweet boy that made me a mama turned SIX years old AND went to his first day of kindergarten! It was such a bittersweet day! A few tears were definitely shed (by me! ), and I swear it was THE longest day waiting to go pick him up! Thankfully he had the best time and was up bright and early excited to go back today! 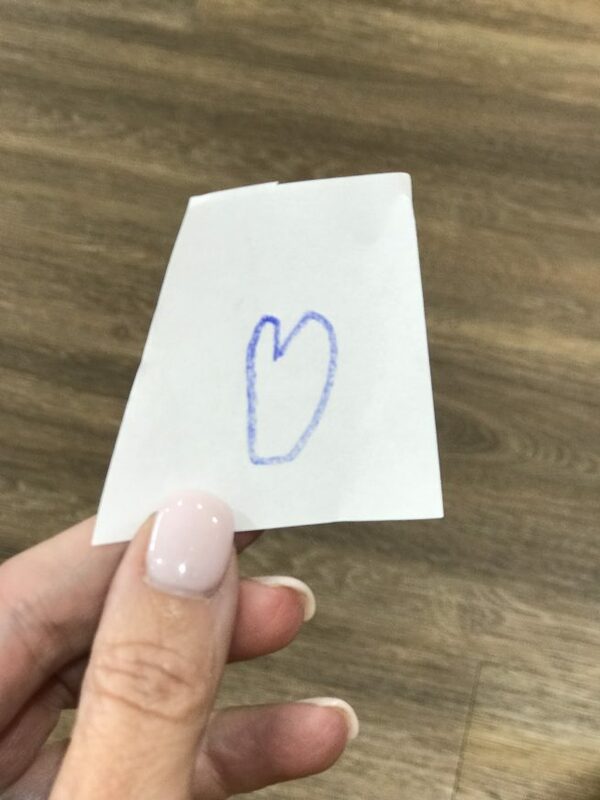 The day before he brought me this little heart and asked me to keep it with me while he was at school. I think my mama heart tripled in size! Sweet boy!!! 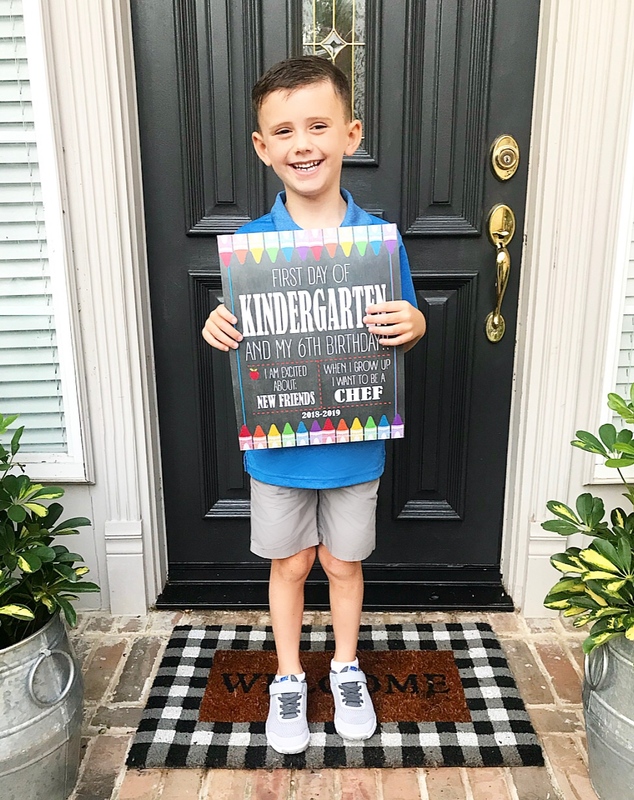 In preparing for kinder I asked my friends on Instagram what traditions they have for their kids for the first day of school! You guys did not disappoint in sharing, so I wanted to compile these ideas in hopes of helping you form your own traditions with your family! As always, I want to stress that SIMPLICITY is key, and if it’s not fun for you, don’t do it! 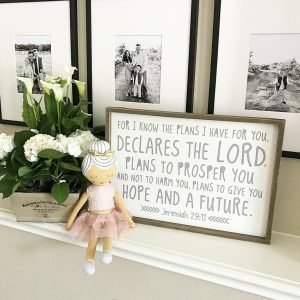 We all “mom” (yes, it’s a verb!) in our own way and EVERY mama I know is amazing! 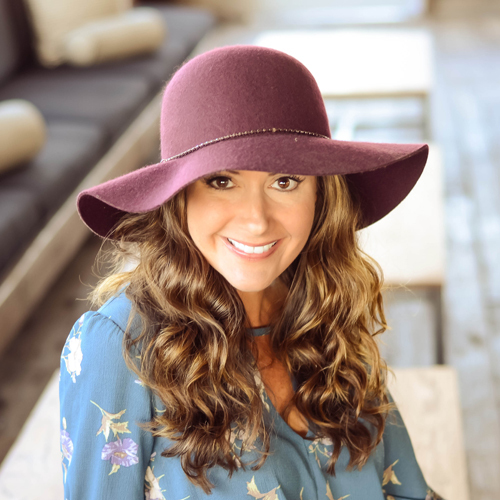 Don’t add undue stress to yourself or feel pressure based on what other mamas are doing! 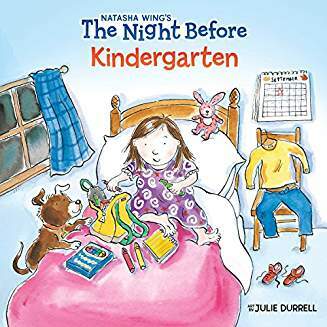 There is a whole series of “The Night Before” and first day of school books, especially if your little is starting kinder! I grabbed this one (mainly because it was in stock at my Target the day before school started…lol) and we had fun reading it! I also interviewed Logan and wrote his answers in the front. 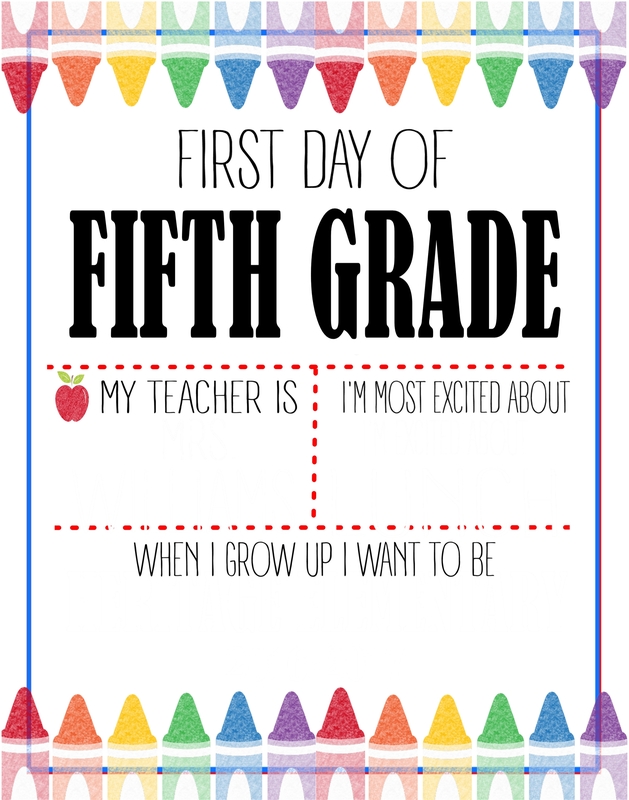 I plan to ask Will (my younger son) the same questions and write them here as well. 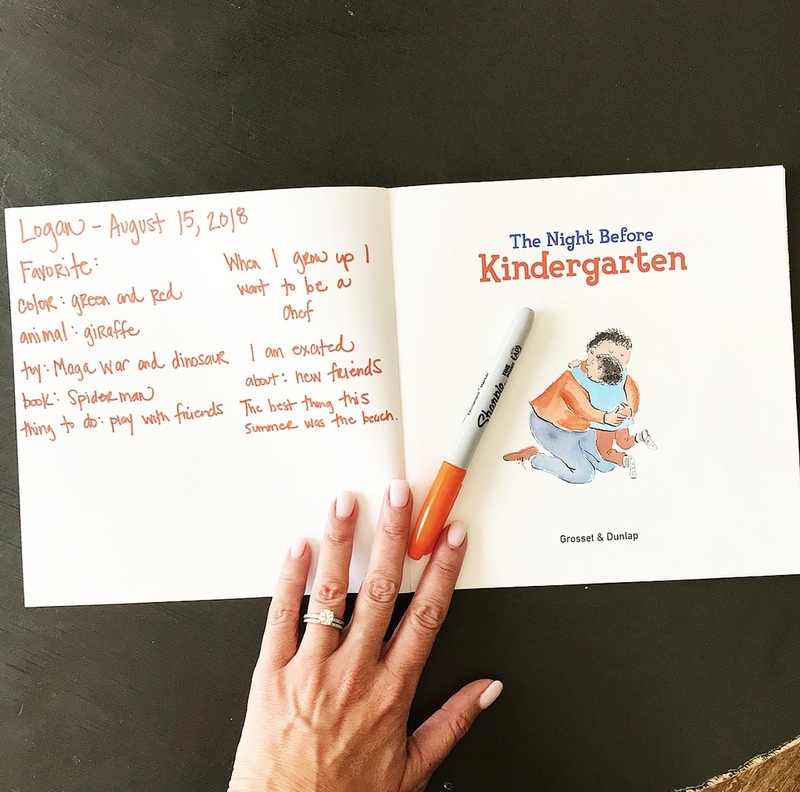 Here are several night before (preschool, kinder and 1st grade) and some other back to school books available on Amazon prime! So many mamas shared their breakfast traditions: colored pancakes, waffles with all the toppings, overnight oats….just to name a few! 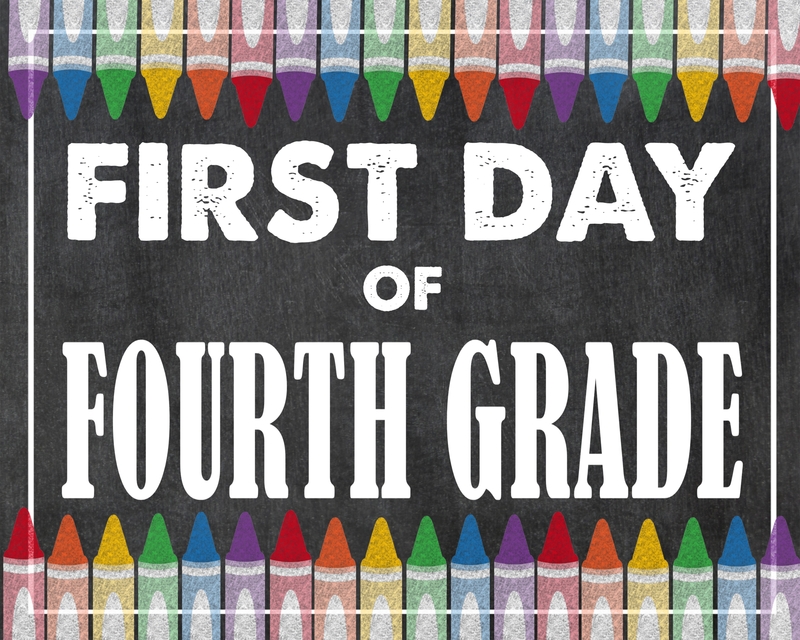 Some said they hit up their favorite donut shop before school start! 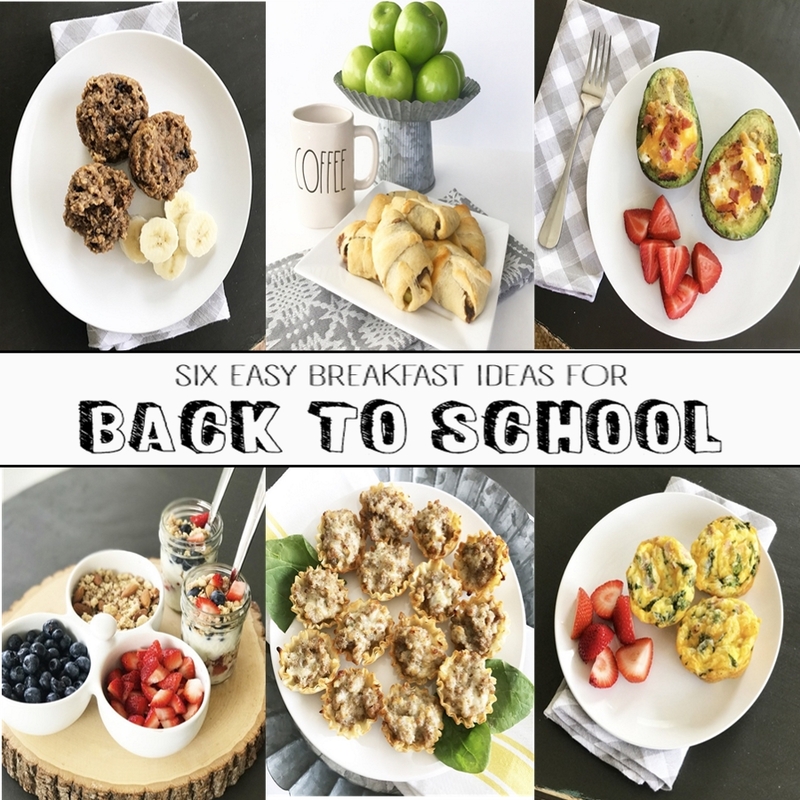 I shared a few quick breakfast ideas in this post. I asked Logan what we wanted and he said banana bread, so we had fun making it together the night before! 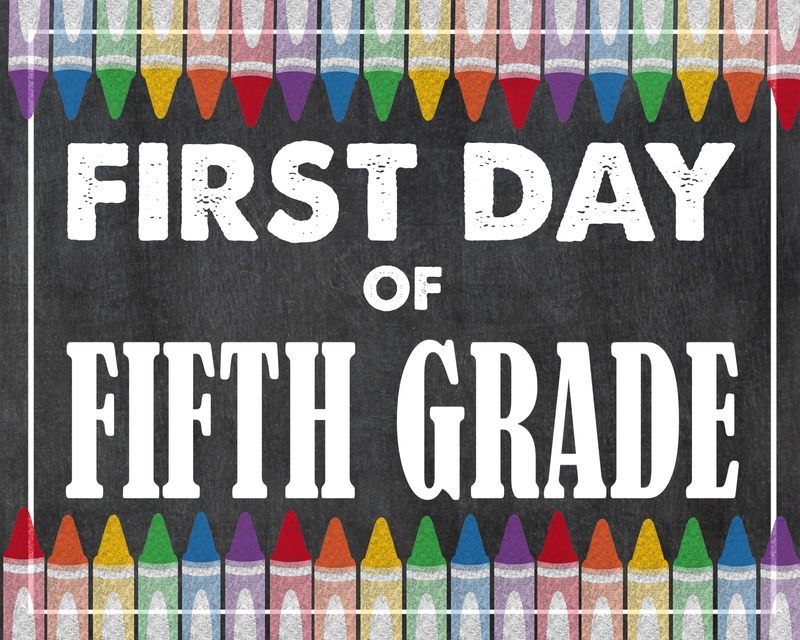 I think the first day of school is my FAVORITE day on social media! 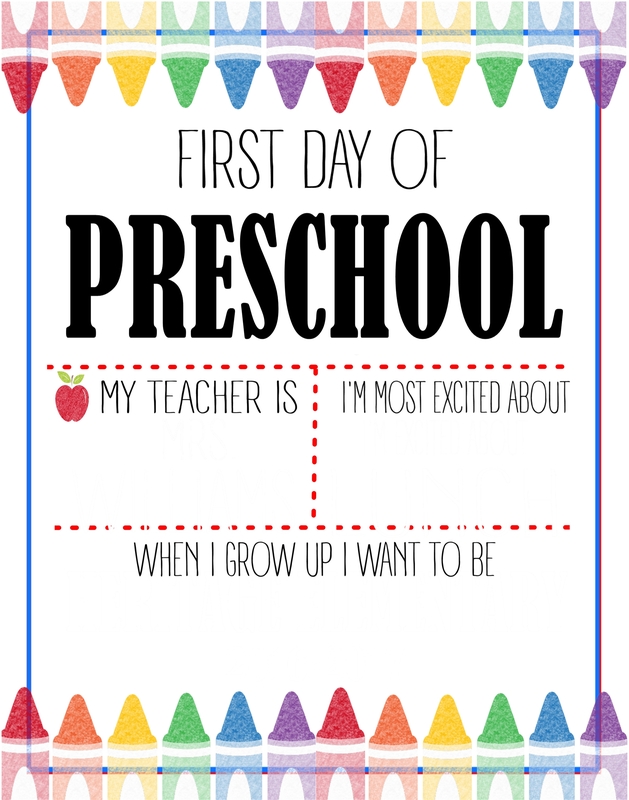 Seeing all the littles so smiley and ready for school seriously warms my mama heart!! 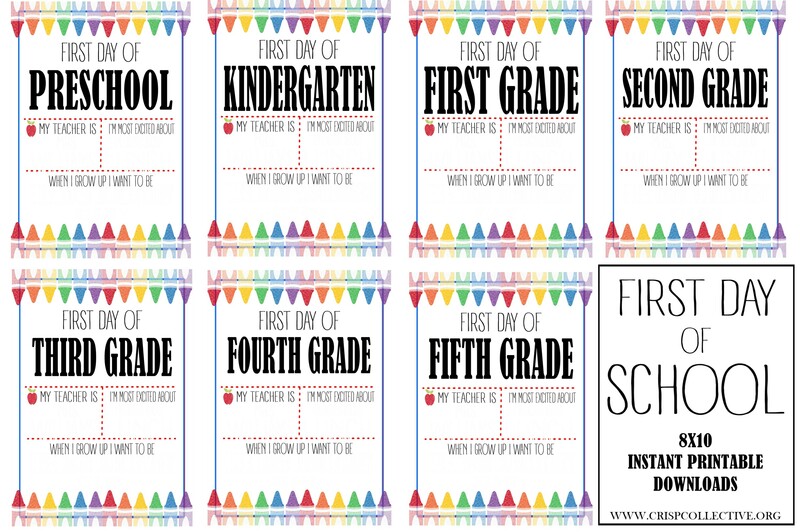 One mama also told me she takes a pic and uses an app to add her child’s stats for that year! 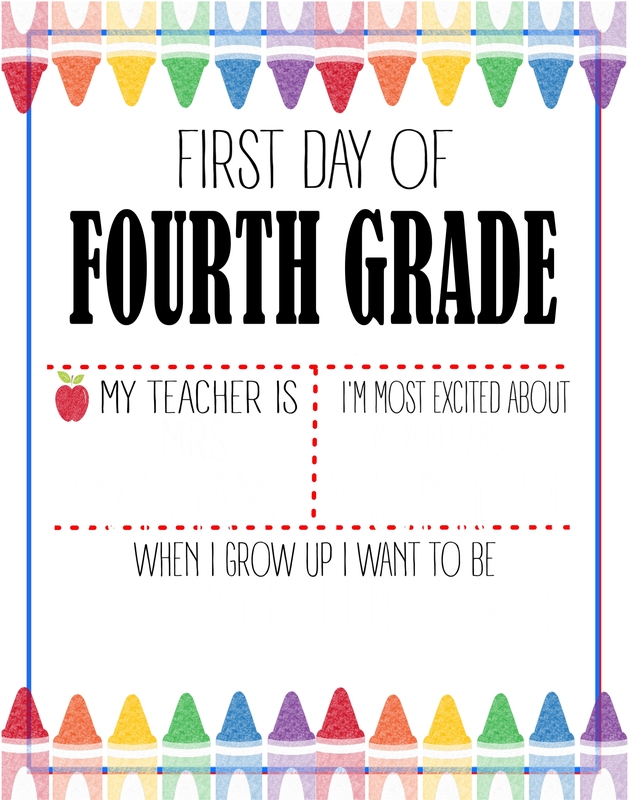 Love that as a non-crafty option! 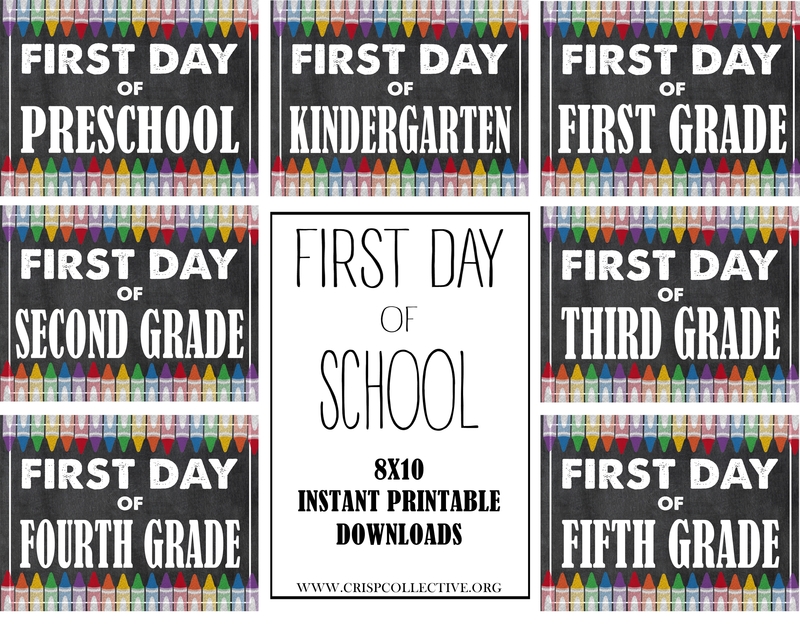 If you’re not really the DIY type, I created these 8×10 printables that can just be printed and framed or your child can just hold the piece of paper. I printed on heavy cardstock and just skipped the frame. Just click on the link(s) below for the grade you need, download and print or send to your local print shop. If you would like to add a little more info, I also created these in an 11×14. 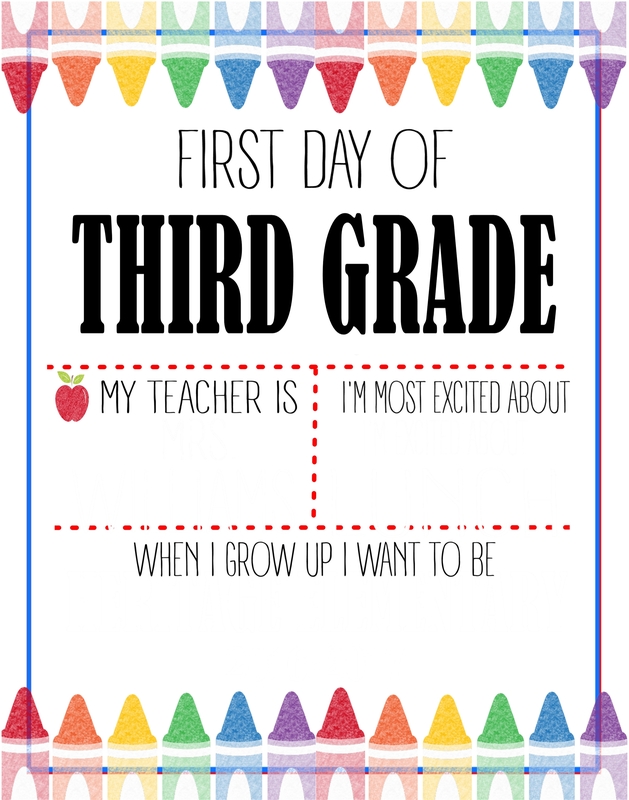 They are white so that you can write the answers in yourself or have your kiddos write them in! Fun to see their sweet handwriting in the pics too! 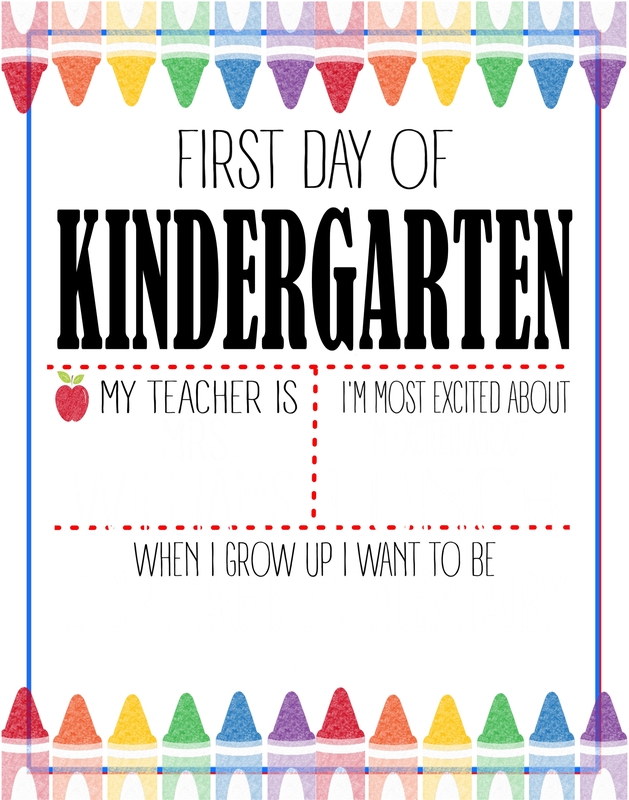 Just click the file below, download and print or send to your local print shop. Backpacks are a big deal at this age, so he wanted a pic of that too! 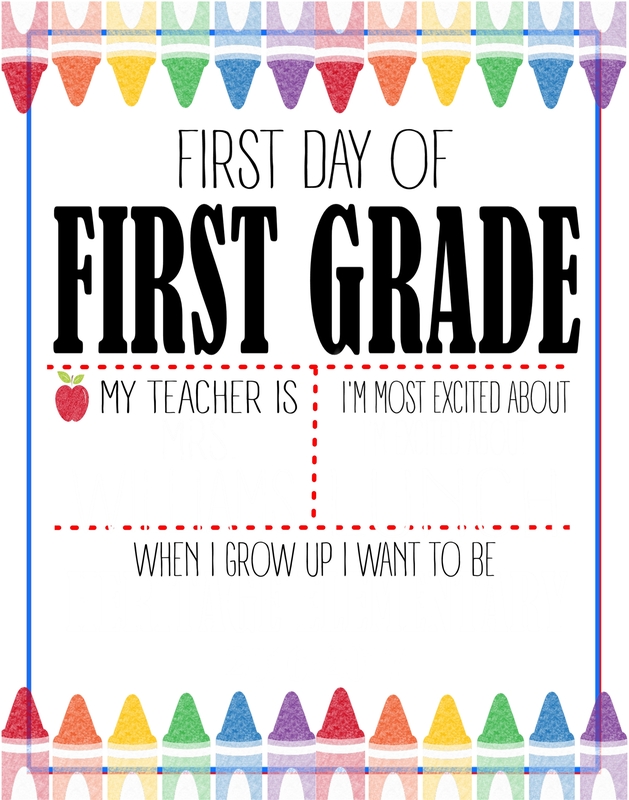 So many mamas said they asked their littles questions every year! Some video it, some keep it in a journal, and others said they put it on the DIY chalkbaord for door pics. I ordered this shirt (available in 5 colors) on Amazon in a men’s large. 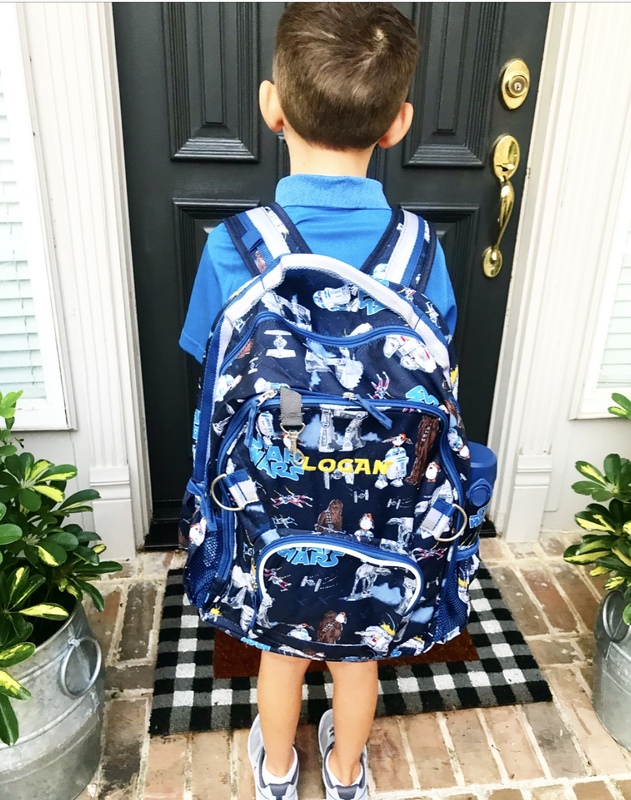 I did not order in time to get Logan’s pic in it the first day of school (mom fail!) but I plan to do it as soon as it arrives. The idea is to get a pic in it every year until his senior year…when this tee will probably actually fit (blows my mind and breaks my mama heart a little!) Now, this one is going to take some major effort to keep up with…like not losing the shirt!… but I think these pics will be SO neat to have when he is a senior! 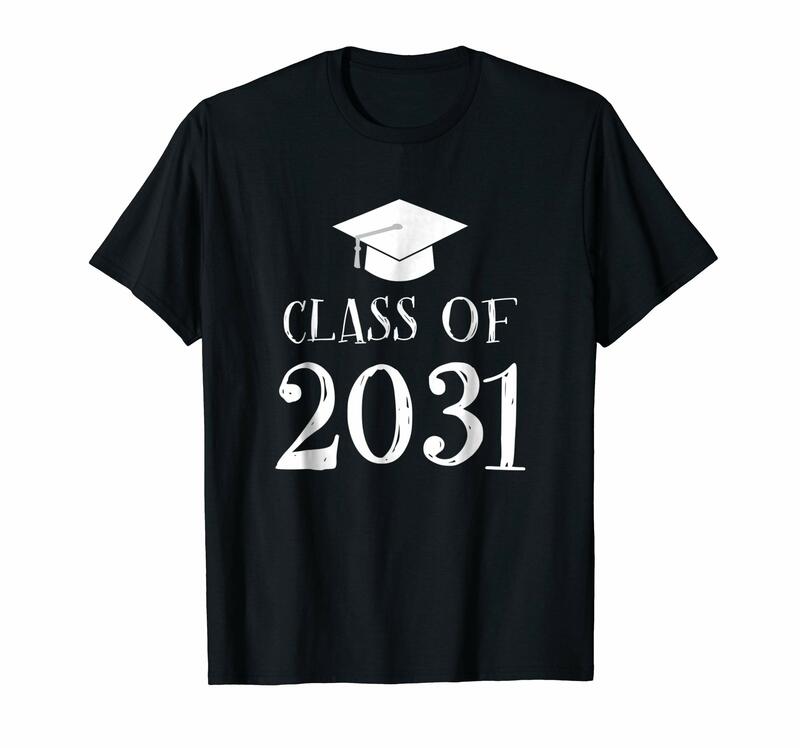 You can find these shirts on Amazon here. 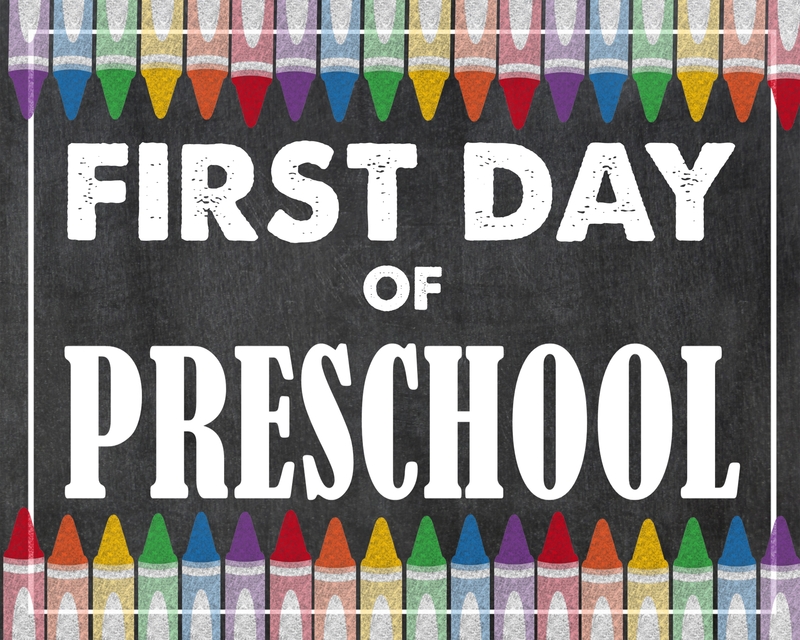 Many mamas also said they have a traditional snack they have each year after school….cookies, brownies, ice cream…. since it was Logan’s birthday, a few sweet friends went with us to our local snow cone shop. 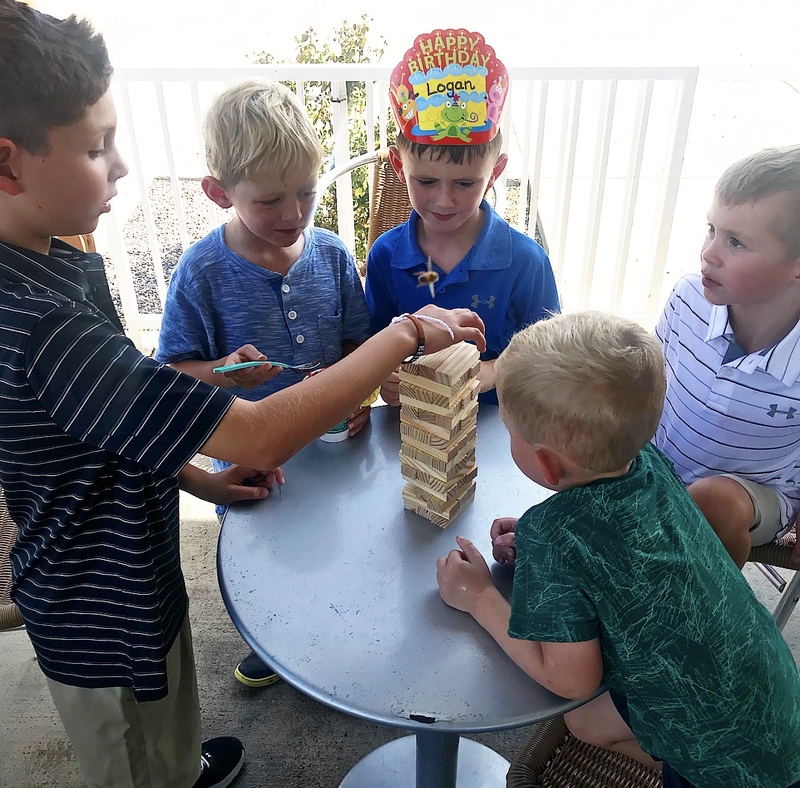 Sweaty hair, snow cones, good friends, a birthday hat from school, and Jenga…six is looking pretty good! We then packed a dinner and ate at our local splash pad. It’s still super hot in Texas and the splash pad was the final push to make sure the boys were worn out enough to fall asleep at their earlier school bedtime! One family says they do a parents vs. kids water balloon fight or nerf war the night before school starts! Hello…FUN! 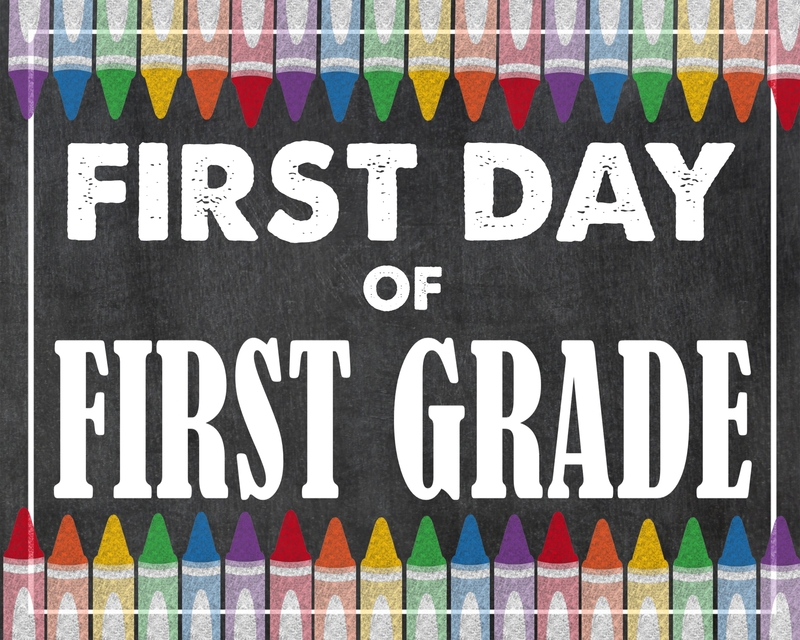 One awesome Mama told me they buy one extra of every school supply item on their list to donate for a kid that might not be able to afford supplies. 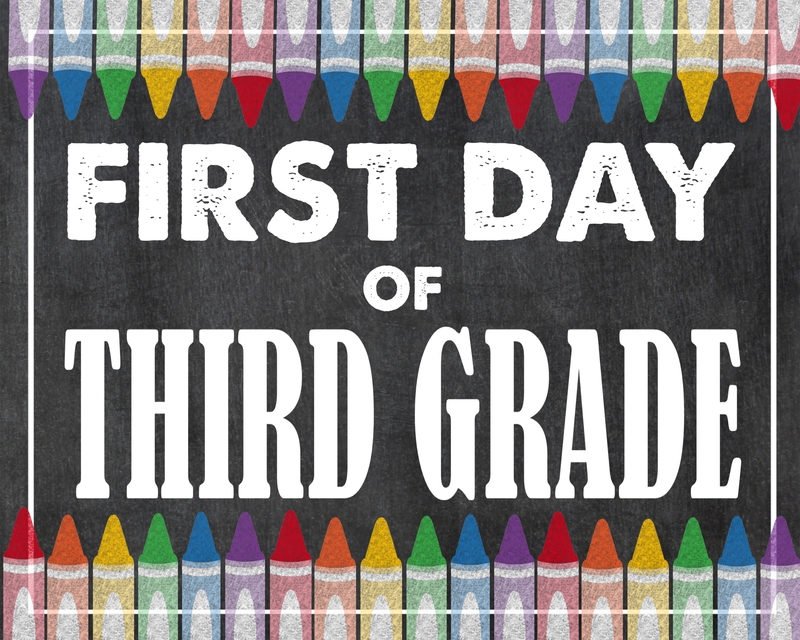 Another Mom told me she asks her kids to meet at least one new friend and learn 3 things about them that she quizzes them on at pickup! 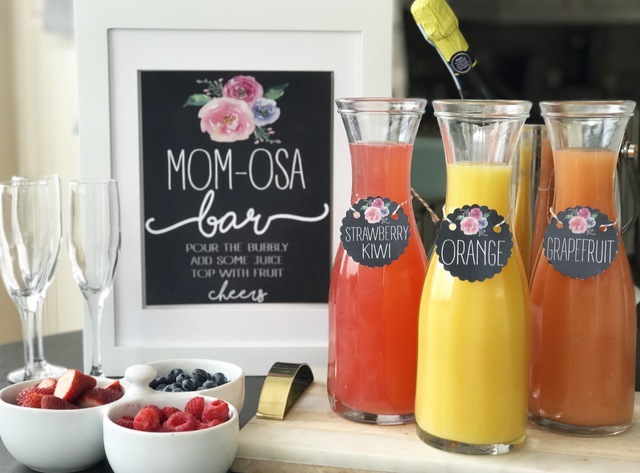 Cheers and Tears, Boo Hoo Woo Hoo Brunch….whatever you decide to call it, you should probably schedule a little celebration of your own because YOU Mama, are amazing! I went to brunch with a few girlfriends, and it was just the distraction I needed to not worry about my babe all day! And if you host a cheers and tears brunch this should probably be on the agenda! 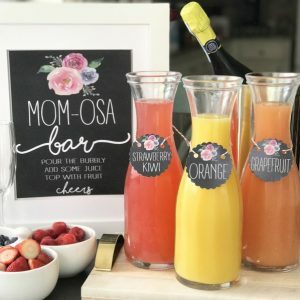 This MOM-osa bar is perfect for baby showers and Mother’s Day, but I’m pretty sure it applies here too! 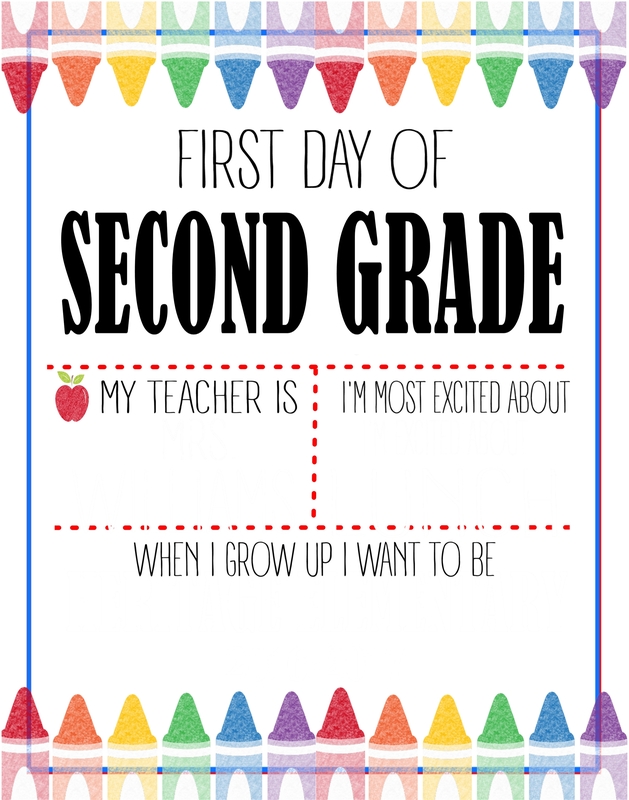 You can find these free printables here. 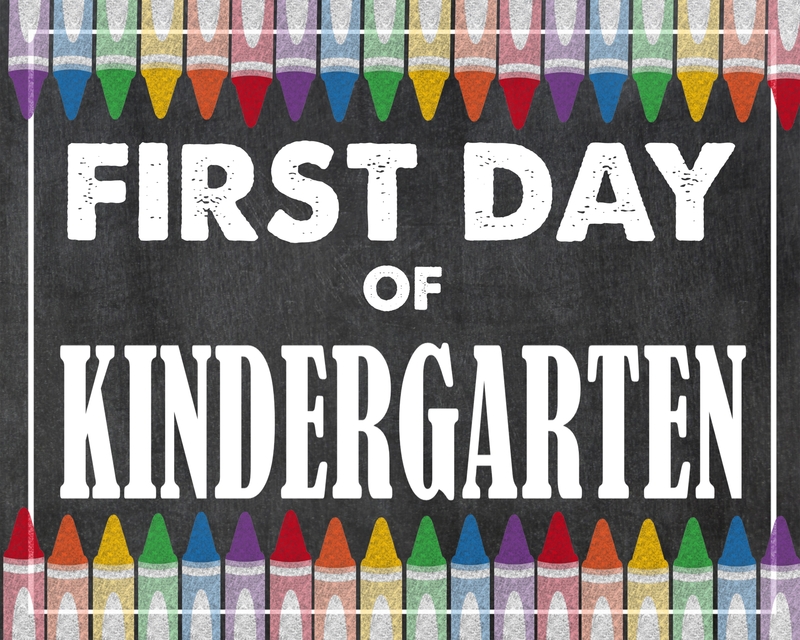 Cheers mama to wrapping up another summer of sweet memories and to all the ways your children will learn and grow this year! 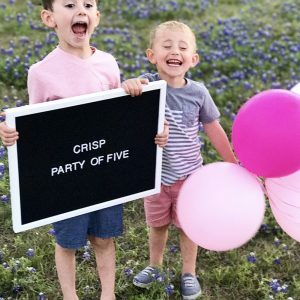 It is such a bittersweet journey to watch our children grow up, but mostly it is THE greatest gift! 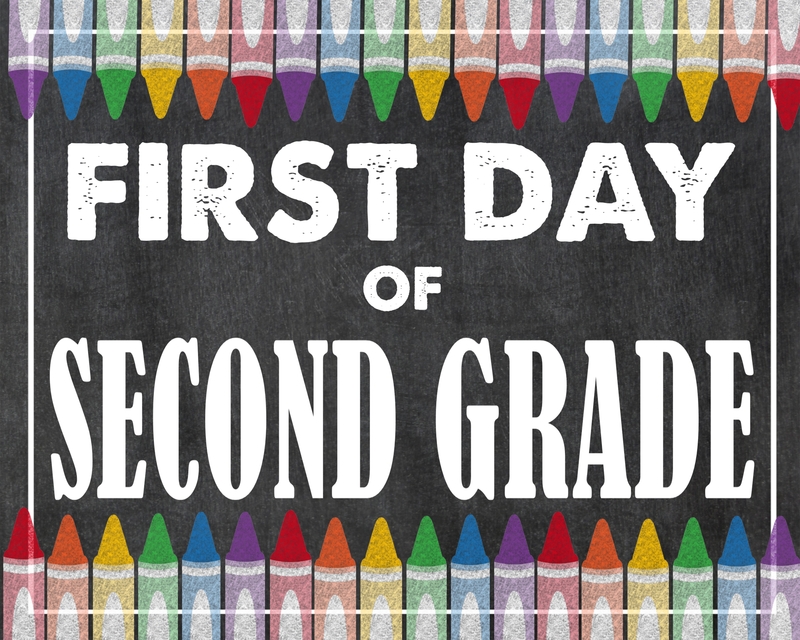 If you have more back to school traditions, I’d love for you to share! 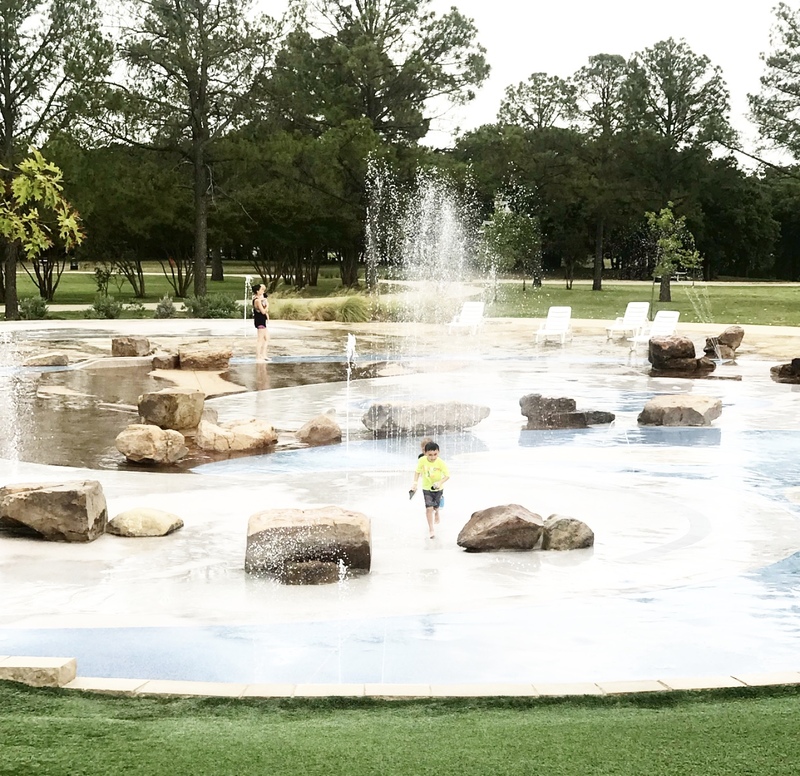 Hey, we recently moved to Texas and I would love to know where that awesome splash pad is? I am hoping it is near-ish to us 🙂 You are right, it is still very hot here!! Welcome to Texas! What area are you in? This is Doubletree Ranch Park in Highland Village! Yes, for sure! I LOVE the Austin area! Hope you guys are loving Texas!